"What is most remarkable about the birth of human art, once it finally began, is how fast it developed. The earliest-known human 'drawings' -- that is, scratches on a rock -- come from Africa and are dated to about 70,000 B.C. But a more accurate date is 40,000 years ago, which is the age of the earliest-known true works of art. These Upper Paleolithic works come in three basic forms: petroglyphs, which are carvings into rock; pictographs, which are paintings on rock (initially with another soft rock, such as red ochre); and portable art (such as small statues, carvings, and the like). The rock art can be further defined by whether it is found inside caves (as in Europe) or on outside rock surfaces (Australia, the Americas). As for the portable art, it can be carved out of rock or carved into a hard biological surface, such as antler or bone. "Two things are especially compelling about this earliest human art. The first is that it is almost always found in 'special' places -- caves, tucked away corners of exposed monoliths (such as Ayers Rock), or interred with the bones of tribal leaders. The second is just how damn good they are as artistic achievements. The little carved 'Venus' statues -- such as the 40,000-year-old Venus of Hohle Fels and even more famously, the 24,000-year-old Venus of Willendorf -- are astonishing works. Their physical distortions, sensuality, and sense of movement wouldn't be seen again until the twentieth century, and remain unsurpassed. "After four teenagers discovered France's Lascaux cave in 1940, the first visitors were dumbstruck -- even though they didn't know the paintings were 17,000 years old -- by the sheer beauty of the artwork. The cave's famous 'Dun Horse' is one of the world's best-known paintings not because of its venerability but because it is so drop-dead beautiful. It is, by any measure, one of the greatest works of art. 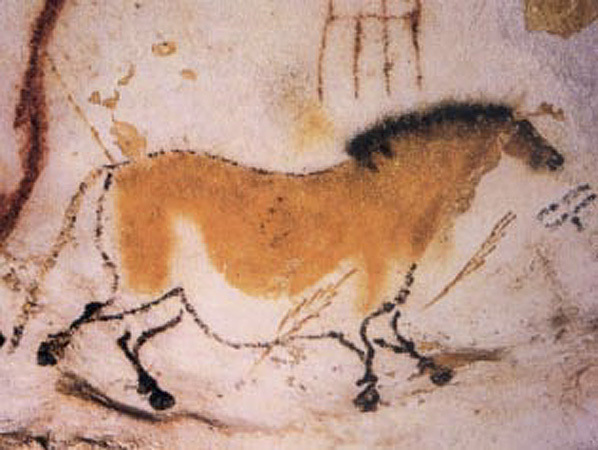 And to a lesser degree, this high quality characterizes other famous Paleolithic artworks from around the world: Egypt's cave of swimmers (from 10,000 years ago); the images of giraffes, men, and horses in the Acacus Mountains of the Sahara Desert (from 10,000 to 12,000 years ago); and the deer carved on deer antlers in the Turobong cave in South Korea (from 40,000 years ago). Many of the techniques and motifs in these works weren't rediscovered until the Renaissance and some not until the Fauvists and Cubists of the twentieth century. "The unique locations and the sheer quality of this Paleolithic art suggest something very important about the rise of imagery and early modern man: While verbal language increased in value to its users the more people used it, symbolic language by comparison conferred its power through exclusivity. That explains the exclusive locations: These images were never readily available to members of the tribe (nor are they today, as the paintings -- as at Lascaux -- are now vulnerable to even the breath of viewers). "Instead, their viewing was probably a very rare and mystical experience, likely available almost exclusively to the patriarch, the chief, or the new breed of leader -- the shaman, whose task it was to manage and control the tribe's access to the infinite, mysterious, and ineffable that their powerful brains had made possible. The shaman, the tribe's chief priest, was the doorman at the portal to life and death, the terrifying and the comforting, the gods and the demons -- a role he often enhanced through the use of newly discovered chemicals (alcohol, hallucinogenics, poisons) that altered the delicate operation of his brain. "It was to the shaman's advantage to enhance the mystical viewing experience as greatly as possible for the rest of the tribe -- and he (and occasionally she) also likely believed that a more intense experience meant his own greater proximity to the gods and the hidden wisdom. Hence the cave: Otherwise, why would you paint such magnificent works of art in the dark? But picture our Paleolithic tribesman, perhaps intoxicated in some way and terrified, being led down into the black bowels of Earth by a man known to have special access to the spirit world, surrounded by sounds and creatures covered with skulls and skins ... and then, in the sudden illumination of a torch, encountering the 'Dun Horse' or the face of his worst nightmare. "It would have been a knee-buckling moment ... and his awe and fear of the shaman, the godlike figure capable of creating this experience, would have been unbounded."